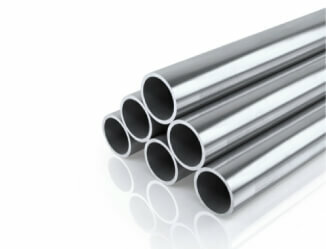 Aluminium is light, strong and resistant to corrosion. Aluminium square sections are often used in outdoor applications therefore the corrosion resistance offered by aluminium is useful in this type of section. Workability and aesthetic appeal of aluminium as a material make it worth consideration for circular hollow sections. Aluminium resists corrosion extremely effectively and therefore is a great material for outdoor applications. It also has an extremely appealing look and this results in a clean professional finish for many outdoor or open plan projects. Many famous structures utilise aluminium due to its light weight and corrosion resistant properties.